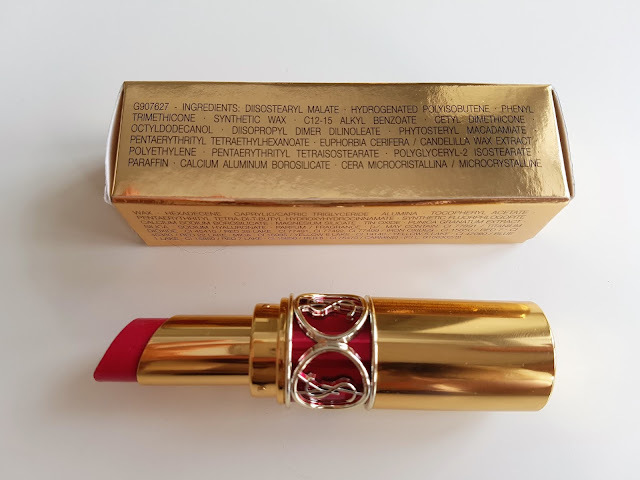 Everyone who follows me and read this blog already know that lipstick is my trademark, a piece of cosmetics without which I seldom get out of the house and which sometimes render my entire makeup. You are also aware of the fact that I prefer stronger colors because neutral ones, as if they fade and disappear, does not come to the fore on my lips. Therefore I'm inclined to more intense red, pink, coral or fuchsia nuances. 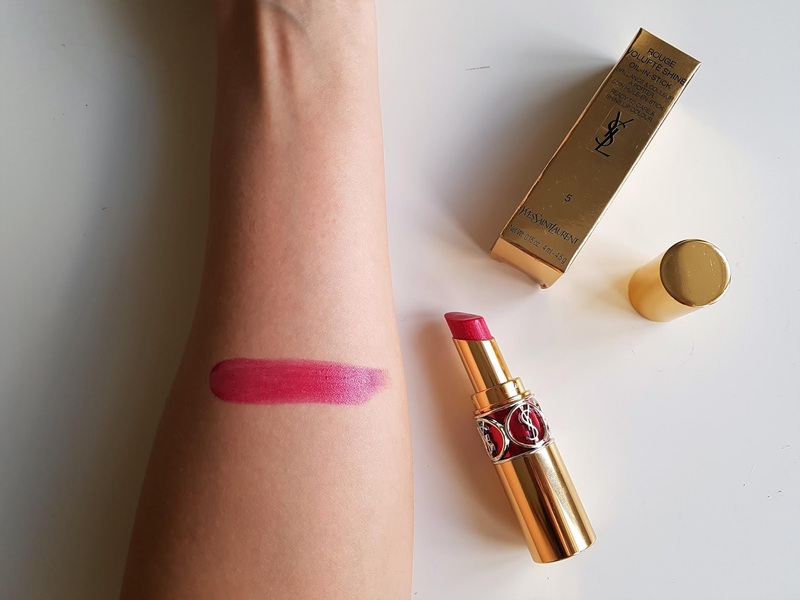 Today I will present you such particular lipstick: YSL Rouge Volupte Shine Oil-In-Stick – Fuchsia In Excess 5. 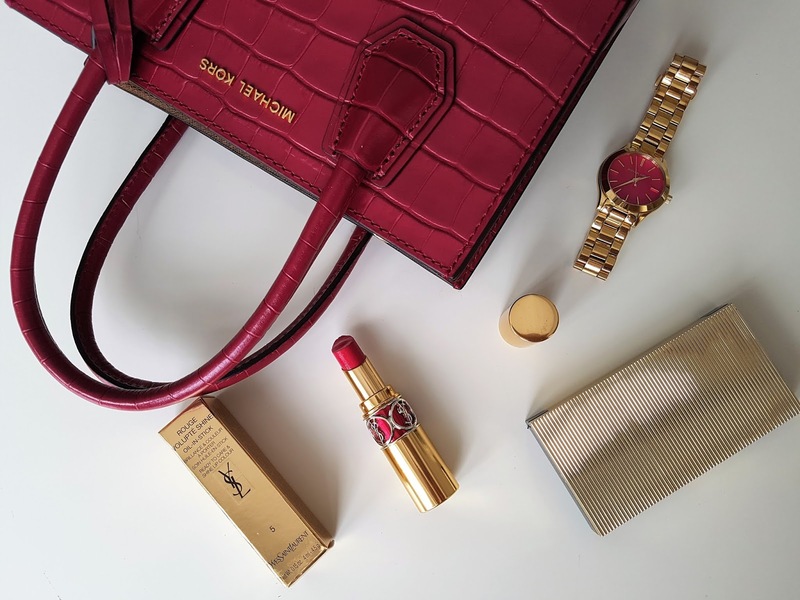 This intensive shade, which looks nifty on the lips and can be, regardless of the season, used throughout the whole year, attracted me immediately. The other thing I liked is the packaging. I'm especially fond of lovley and original packaging that is recognizable and can stand alone as decoration. 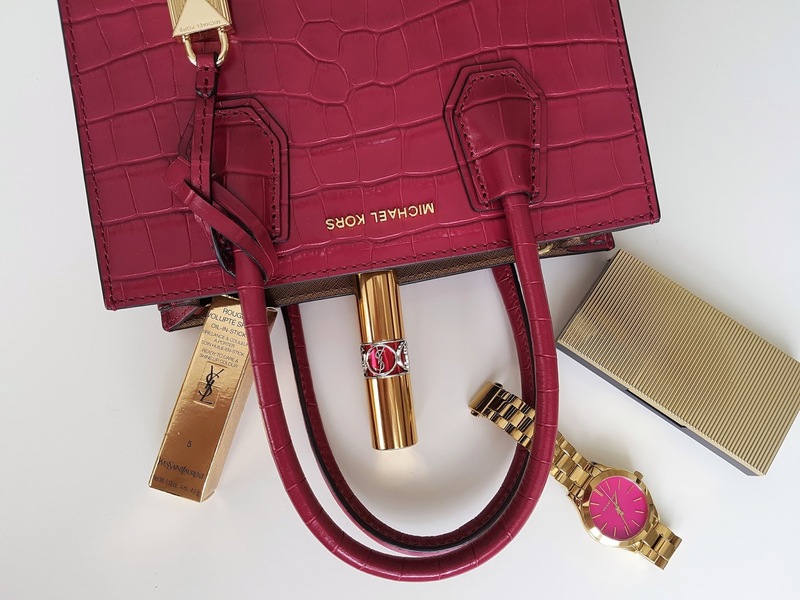 All of this is characteristical to the YSL Rouge Volupte, which is golden on the upper and lower part and in the middle linked by the ring with brand's logo, behind which the color of lipstick can be seen. Personally, I consider this packaging to be one of the most adorable in beauty industry. 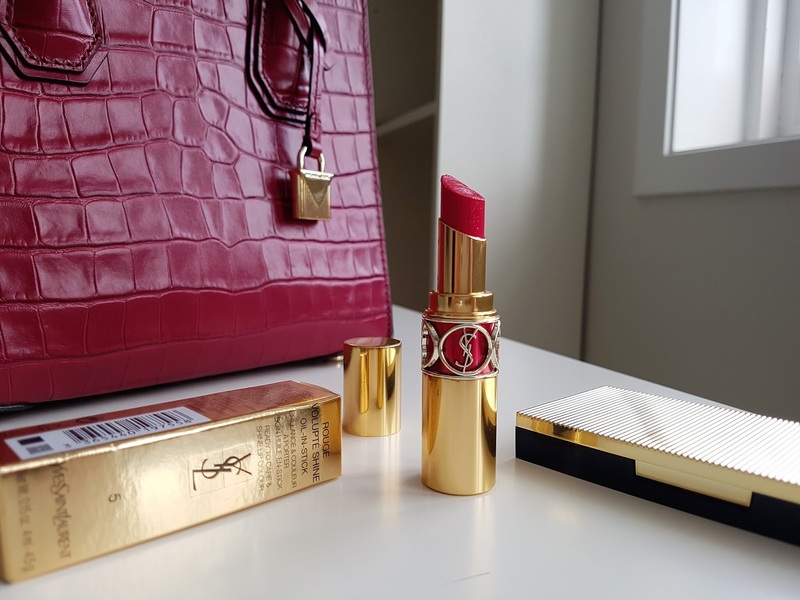 I'm a big fan of oily textures and YSL Rouge Volupte, in my opinion, has a perfect, easily applicable one. As an effective coctail it features everything needed for complete and thorough lip care: hyaluronic acid that hydrates, retains moisture and shields against drying, pomegranate and rice which, as antioxidants, fights with free radicals, emollients that softens and smoothens the skin and provide extreme protection and comfort, Candelilla wax that is responsible for intensive shine and bright colors and which, in combination with silicone oils, encases the lips with brilliant top film and enhances shades. As quoted in the name itself, Oil-In-Stick contains 60% oil and the formula is based on oil, pomegranate, macadamia butter, hyaluronic acid and pearl pigment. Deep moisturizing texture ensures instant absorption, suavity, humour, high gloss, amenity and nursing during the day, leaving a sense of fullness on the lips. I disagree with the statement that it is a lipstick with medium power of overlaying, because one layer is quite enough for solid and stable coloring. Even though it stays on the lips after the meal, I still like to „fix it“ a bit. In addition to all the above, it's enriched with a wonderful scent. I was thrilled when I opened it and felt the aroma of fresh mango that didn't worn off upon usage. Due to it's silky, nourishing and cultivating texture, luxuriuos packaging and glamorous sensation when applied, this kind of lipstick evokes a diva in you and gives your lips a grand and seductive complexion. 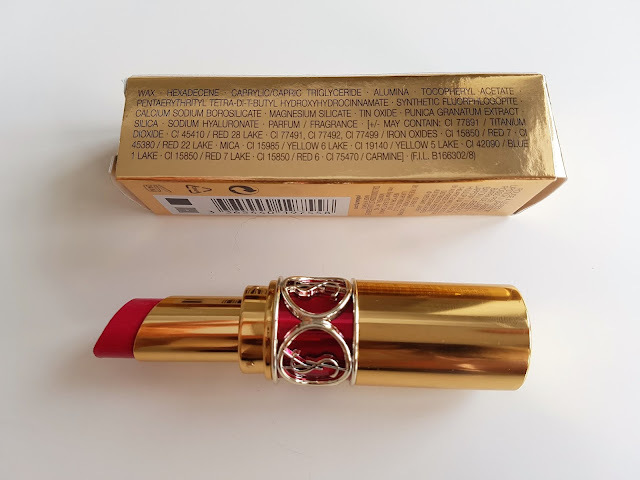 Have you tried some of these lipsticks? In which nuance? What are your impressions? The shade of lipstick is so lovely but all other things with it in the photo gives very good impression. Thank you so much for your kind words. I really appreciate it and I'm glad to hear that you like this shade of lipstick. It is one of my favorite.